Tilted Horizons: BMW S 1000 RR (finally) unveilled! 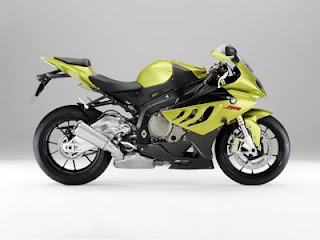 BMW S 1000 RR (finally) unveilled! 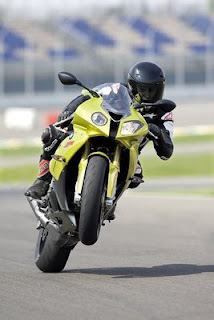 One of the most anticipated motorcycles in recent years, the BMW S 1000 RR, premiered last Saturday at Monza during the Superbike World Championship race weekend. BMW's first true sportsbike supposedly weighs only 404 lbs. and cranks out 193 HP. The tech-wizzardry includes a 4-stage ABS system, with settings for Rain, Sport, Race and Slick conditions. Typical for BMW, the styling exercise is a little...ummmm, different, with both asymmetrical headlights and asymmetrical body panels. BMW Motorrad USA says the RR will be U.S. showrooms by early 2010. Pricing hasn't been announced, but I expect you'll need a 2nd mortgage...or federal bail-out money. This is not your father's BMW.